We all know that Venice is popular, but it seems to be even more so this year than most. People want to see for themselves if it is really as cultured, beautiful and romantic as it is purposed to be. Taking the train to Venice also seems to be becoming more and more popular. Easily reachable in two days with a nice stop in Switzerland or Northern Italy, it’s a much more comfortable way to travel, and comes with the added perks of incredible alpine scenery. There’s also the option of the overnight sleep train to Venice, for those that don’t want to lose a day en-route. Having worked in rail travel for the last two years, here are my Top Five ways to take the train to Venice. Starting in London St Pancras International, as so many trips to the continent do, catch the Eurostar through the Channel Tunnel, across Northern France to Paris , where depending on your train you will have time for some lunch and sightseeing. Connect that evening with an onward train to Venice and arrive the next morning! The Thello sleeper train to Venice departs from Paris Gare de Lyon everyday at 19:11, so book your Eurostar tickets depending on how long you want in Paris to explore. Catch the Eurostar to Paris and change trains onto the high speed TGV Lyria service, travelling south east through France, into Switzerland and on to Zurich. Trains from Paris to Zurich (TGV) run at 11:57, 16:23 and 18:23. The journey takes around four hours. Having done this very trip to this point myself I would highly recommended the gorgeous Schweizerhof Hotel Zurich if you need somewhere to stay in Zurich! After boozy night out or quiet evening meal (whatever tickles your fancy), get up early and take the Eurocity train #13 at 07:32 to Milan Central. This route will take your through the very scenic Gotthard pass; typically Swiss mountains and magnificent lakes. You’ll arrive in Milan with about an hour change, perfect for some Italian coffee, before you get the 12:05 Eurocity #37 to Venice, arriving at 14:40 (Italian time). This is the ideal route for travellers who like to take their time, and who REALLY like trains! As with the previous journeys, this one starts with a Eurostar from London to Paris. If you want to break up the journey, perhaps stop over in Paris, or continue on instead straight to Zurich. Then next day continue your journey to Tirano aboard the Bernina Express, where you can stop over for a night or continue on to Milan, and ultimately Venice. From Zurich take the 07:07 Swiss Intercity train to Chur arriving at 08:22. From Chur, board the Bernina Express at 08:32 all the way to Tirano. It seems like a quick change but Swiss trains run like clockwork so you’ll have plenty of time. The Bernina Express arrives in Tirano at 12:45. There’s an Italian regional train at 13:10 to Milan if you choose not to stop over, arriving at 15:40. The trains to Venice are then every half an hour! What better way could there possibly be to journey to an iconic city like Venice, than aboard the luxurious carriages of the Venice Simplon-Orient-Express? The Belmond British Pullman transfers you in style through the Kent countryside with brunch and a Bellini. Once in France, board the blue and gold carriages of the Continental Wagons-Lits and settle into your private compartment. Relive the golden age of travel, dress for dinner, dine on exquisite food, sip cocktails and swap stories with fellow travellers in the Bar Car, or relax in the Art Deco surroundings of the Champagne Bar! 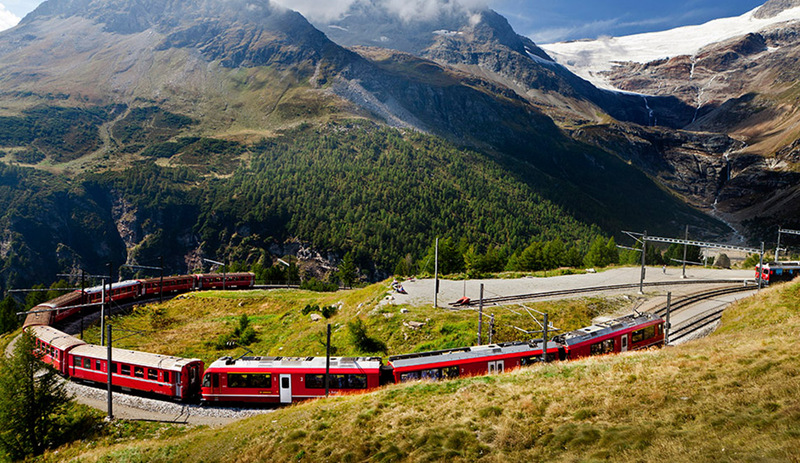 Watch the magnificent scenery of France and Switzerland pass by as you make your way to Italy. If you want a slightly longer trip to make the most of the Swiss / Italian scenery, then consider a stop at Lake Como. Its serene lake flanked by tall mountains is a bit of a perfectly idyllic setting to relax and unwind, before heading to the city of romance, Venice. This journey starts exactly the same as the other: Eurostar to Paris, Paris to Zurich. After your stop in Zurich take the 11:32 Eurocity #17 direct to Como S. Giovanni. After a few nights, or however long you need, head to Venice. Trains a pretty regular but all require a change in Milan Centrale. The quickest option (3 hours 27m) would be at 13:13, changing in Milan at 13:50 and arrive in Venice at 16:40. Highly recommended! : If travelling via Zurich check Schweizerhof Hotel Zurich – one of my favourite hotels in the world and famous for the free chocolate delivered to your room in the evening! All train times and suggestions are based on travel Monday to Saturday. Sundays are a completely different ball games. All times are correct at the time of publishing – but don’t blame me if they change in the mean time!